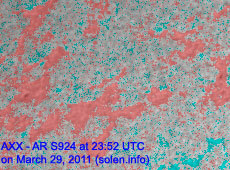 Last major update issued on March 30, 2011 at 03:35 UTC. 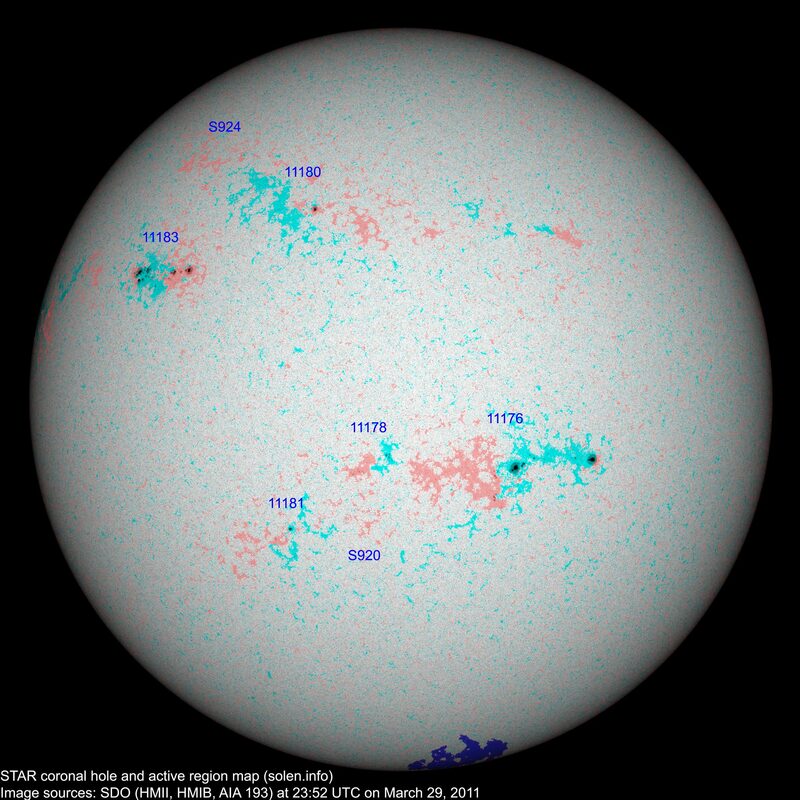 The geomagnetic field was quiet to unsettled on March 29. Solar wind speed ranged between 306-387 km/s. 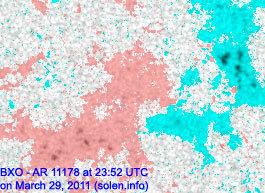 A solar wind shock was observed at SOHO at 15:13 UTC. 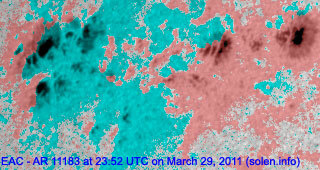 Although solar wind speed didn't increase much, wind density became very high until late in the day. 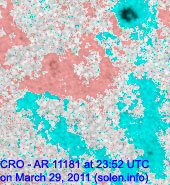 The shock was associated with the partial halo CME observed on March 24 (M1 flare in region 11176). The interplanetary magnetic field was mostly northwards after the shock, with the exeception of a southward excursion 21:30 to 23:10 UTC. 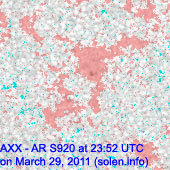 Solar flux estimated at 20h UTC on 2.8 GHz was 116.2 (increasing 2.8 over the last solar rotation). The planetary A index was 4 (STAR Ap - based on the mean of three hour interval ap indices: 4.4). Three hour interval K indices: 00011213 (planetary), 00011212 (Boulder). Region 11176 decayed slowly losing some of its smallest spots, there's penumbra only on leading polarity spots. The spots in the region extend longitudinally over 30 degrees (from W03 to W33, however, there is only penumbra at one end of the region. 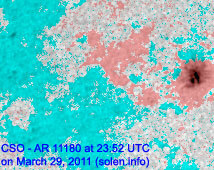 Region 11183 didn't change significantly, there's still only minor polarity intermixing. Flares: C1.1 at 05:15 at C1.2 at 21:29 UTC. [S920] reemerged on March 27. Location at midnight: S27E05. [S924] emerged with a couple of tiny spots in an old plage area on March 29. Location at midnight: N35E35. Another large CME was observed over the east limb after 21:10 UTC in LASCO images. March 27-29: No obviously Earth directed CMEs were observed in LASCO and STEREO imagery. 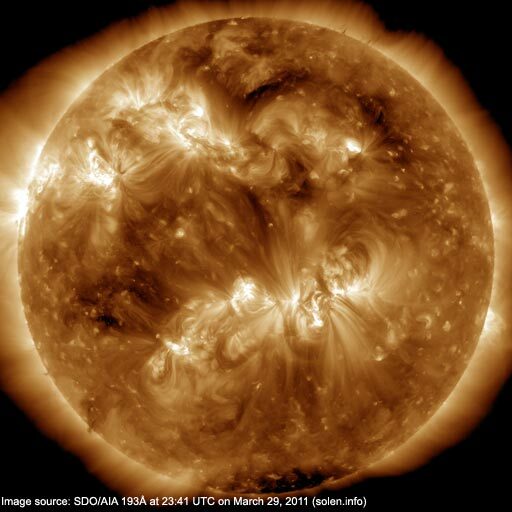 The geomagnetic field is expected to be quiet to active on March 30 due to CME effects and quiet on March 31 - April 1.